Hello again one and all, thanks for joining us here at Judge of the Week! Being an Emcee in the real world, our guest today knows more about introductions than I ever will, but it seemed unfair to ask him to do all of the work. He has kindly assembled for us a slew of anecdotes and stories from his judging exploits just for our enjoyment. Let us welcome to the stage the World-Travelling Master of Ceremonies himself…Sashi Kumar Balakrishnan ! Favorite card: Unhinged Island. I have always enjoyed playing blue decks and having this particular Island gives me a thrill! Random fact about yourself: I take a handstand photo in front of iconic/famous landmarks/buildings around the world. I started judging because I used to own a store and we wanted to get a certified judge for our tournaments. So I asked around on how to get on staff for the next GP Kuala Lumpur in 2004 and I went in and took my L1 test and passed. Since then I have been judging for 14 years now and my reasons have continued to evolve. I started loving the game and wanted to be more involved in it. So, I started judging GPs and they were further and further away. The travelling made the judge life much more interesting and I was really enjoying going to places I’ve always wanted to go to. Considering my first European GP was GP Paris 2014, I was in awe throughout the trip. Going to all these amazing GPs around the world, I started becoming close friends with some of the judges. The judge program has allowed me to make some amazing friends over the years. I started making judging plans based on who I would get to meet and hang out with. Now the main reason I judge is an amalgamation of all those previous reasons (except the first one because I have since moved on from owning a store). Always have a plan. Always have an idea of the ruling. Always think of a solution. Then ask the questions. The program is so huge that support can come from anywhere and everywhere. Overcome that shyness and fear of making a mistake. Everyone makes mistakes. It is what you learn from those mistakes that develop you as a judge and as a person. Make friends and try to talk to all the judges you can when attending a GP/Conference. There’s always something new you can learn from all the new judges you meet. So many times, a GP trip has become better after/before the GP itself because of the extra activities planned. On my first trip to Beijing, I joined Riccardo Tessitori and Matteo Callegari on a visit to the Great Wall of China. I will never walk up and down that many stairs in one day ever again! On my first GP Manila, a bunch of us planned to celebrate New Year there and we had a blast. It was an Italian, a Romanian, an American, a Belgian, a Serbian and a Malaysian having fun. We flew in 2 days before new year and the GP was 2 days after and we hung out, had dinner before the clock struck 12 and then partied the night! 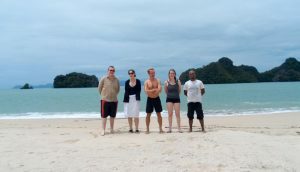 In 2016, I organised an island getaway before my home GP, GP Kuala Lumpur, where another bunch of judges and I had an awesome time. These are the non-judging things that have made judging for me an absolutely amazing experience. Growing as a person and meeting amazing people who have become my friends, teachers, and mentors while having fun together. Wearn Chong , my RC has always been someone who is always available whenever I needed help. He has been guiding me since I certified til now and that has shaped who I am as a judge. I admire how he approaches an issue or problem, by considering all possible solutions and then choosing one that seems the best while keeping a level head and a sense of humor. His approachability and wanting good things for all judges in the region is something I have always admired and have tried to emulate. Signature picture photobombed by a picture-taker in Shanghai. My current favourite non-Magic hobby is Pokémon Go and I have been playing it quite a lot since the game started in 2016. The PoGo community in Malaysia is also huge and I have been quite active. Travelling for Magic GPs has also helped me collect my regional pokémons! While watching videos on playing the game, I developed an interest to make videos of my travels. Now I make YouTube videos travelling and playing Pokémon Go and last year has been really good to me. I ended last year by making a feature video on Malaysian Nationals on my own. In 2001, two of my friends who used to play Magic had started playing again during the Invasion block. One day we were hanging out and they were like, “Sashi , you like games right? You’ll love this!”. And then they played in front of me and taught me how to play as well. The first deck I played was the Rebels deck with Lin Sivvi, Defiant Hero. I have been hooked on the game ever since. Started going to the local game store and bought a pre-constructed deck. Made friends playing the game at the store and it just went on from there. I guess the proudest moment of my Judge life was when I made Level 2 in 2010. After that, I have had small achievements that I am proud of such as passing my Day 2 TLC, even though I have already lead teams in day 1 of a GP twice. The trust that the HJs had in me made me feel like my hard work paid off. Also during GP Birmingham, I was put in charge of the Kickstarter team and at one point we had almost maximum capacity players in the room! We had very little space to put tournaments. I had to maneuver the other tournaments to free up space and we managed really well. I was recognised during the judge after party for that and it made me feel good. Currently, I am the project lead for the Magic Judges Twitter Account and I am also proud of achieving this but there is always things to do that can make things better. So 2018 is a good year to look forward to. Island vacation before a Grand Prix with Jonathon East, Leanne Capewell, Riccardo Tessitori, and Laura Ellis. 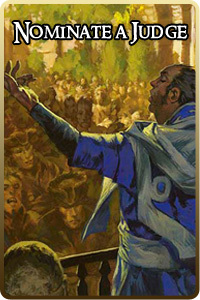 I have always identified with Teferi as a Magic character and I am happy that he became a Planeswalker. Being an Indian magic player with not much representation in Magic characters, I related to a dark skinned Planeswalker and I also loved his ability as a creature. -10 : Search your library for 3 cards and put them in your hand. Cards you own that aren’t on the battlefield have flash and cost 0 mana to cast until your next turn. 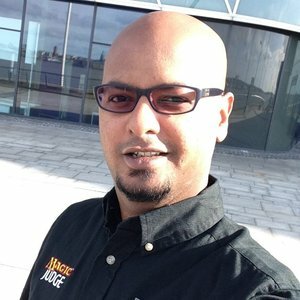 For the triple Modern Masters weekend, I was interviewed by coverage. You can find the video here. Thanks again, Sashi , for giving us a peek into your life and letting us see just a small portion of how awesome you are. You have been incredibly giving with your time, but we have just one more thing thing to ask of you…. 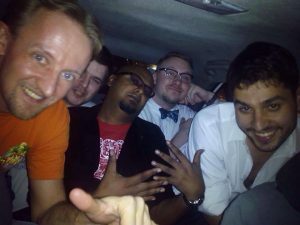 I used to be part of a famous award winning rap group in Malaysia. I used to own a Magic store named The Tabernacle. I judged in 15 GPs on 4 continents last year. William Tiddi’s most prized collection is not of artist-made Turtle tokens, but actually Chicken tokens that he collects at every GP and similar large events. It started as a joke for his girlfriend, but now it is a tradition! Statement 2 is false! Shop was called Pendelhaven!